Our goal at I-TAP is to ensure that your electrical training is not just useful and practical, but cost effective as well. Below you can find information on educational grants and financing opportunities that may be available for you to take advantage of when you enroll in our program, or after you complete it. Please note: The availability of funding from outside agencies, such as those identified below, is at the discretion of those agencies. I-TAP cannot and does not guarantee approval processes that are independent of our organization. We do, however, assist students in understanding these organizations’ requirements, so that you will be more likely to be approved for funding and/or grants. Please feel free to contact us if you have any questions about obtaining financial assistance. As a nonprofit organization, in alignment with our accreditation goals and guidelines, I-TAP participates in funding student grants as part of our community outreach. We will help you get funding if your other funding sources do not cover your entire tuition amount, up to a maximum grant of $5,000. First, you must complete the program within the originally contracted timeframe. Within 30 days of completing the program, secure a job in the electrical field to earn a $1,000 credit towards your tuition balance. Maintain your employment for no less than 30 days to earn a $1,000 credit. Complete 800 On the Job (OJT) hours within 6 months of graduation to earn a $1,500 credit. Complete 1,600 OJT hours within 1 year of graduation to earn a final $1,500 credit, for a total of $5,000 in grant awards. I-TAP offers in-house loans to students who receive at least one grant from an outside organization and successfully graduate from our 26 week course. These loans don’t become due for repayment until after graduation, giving you time to find employment and start getting paid. 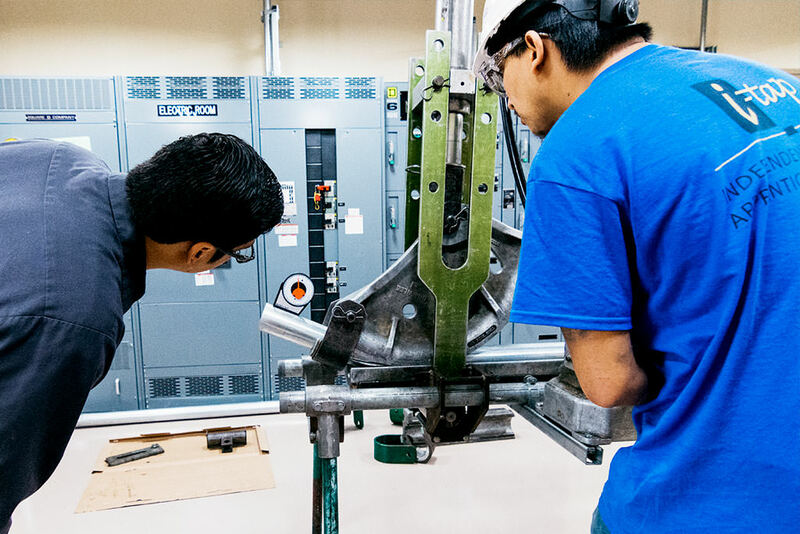 Under the provisions of the Workforce Innovation and Opportunity Act of 2014, the state of California offers grants to qualifying students who meet certain basic guidelines for assistance. Students can qualify for WIOA assistance based upon financial challenges such as low income, being a parent, having a learning disability, diagnosis of ADHD, and/or other qualifying determinations subject to WIOA’s current regulations. To start the process of applying for a WIOA grant, visit the America’s Job Center of California website to find the job center office nearest you. The representatives there will walk you through the WIOA application process. Under the provisions of the Workforce Innovation and Opportunity Act of 2014, the state of California offers grants to qualifying students who meet certain basic guidelines for assistance. Students can qualify for WIOA assistance based upon financial challenges such as low income, being a parent, having a learning disability, diagnosis of ADHD, and/or other qualifying determinations subject to WIOA's current regulations. To start the process of applying for a WIOA grant, visit the America's Job Center of California website to find the job center office nearest you. The representatives there will walk you through the WIOA application process. If you are a veteran, first of all, thank you for your service to our country, and we would love to have you here at I-TAP! I-TAP qualifies for coverage under the G.I. Bill, meaning that you can get your training at I-TAP at no cost to you, while also receiving a monthly cost of living stipend. To apply your G.I. Bill benefits to your I-TAP education, just register at the Department of Veterans Affairs' eBenefits website. In addition, Vocational Rehabilitation and Employment benefits can be used to fund your I-TAP education. We will attempt to link you up with these and other organizations if appropriate, and will assist you in coordinating the application processes. Also, if you are aware of a grant that is not listed on this page, please let us know. We will research it and help coordinate it with you!